Should I have my carpets and upholstery protected with Teflon? When carpeting is made, it has two protective properties. One is a “dye blocker” or “stain resist” property. This is simply a clear dye to penetrate the fiber. The second is a “soil resistor”. This is a product that is sprayed on the yarn and baked on at a high temperature. This helps to resist against common dry soil, and as a barrier between the spill and the dye blocker. 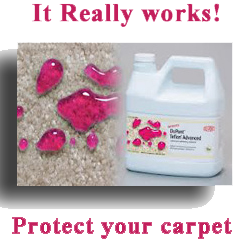 The Carpet Manufacturers recommend re-applying protector after cleaning. After applying protector to the carpet, more dry soil will be removed with normal vacuuming. And most spots can be removed with just water. WARNING! YOUR CARPET NEEDS PROTECTION! Regular foot traffic removes much of the factory protection from your carpet. Leaving it unprotected could allow permanent stains, premature wear and a lower appearance level. 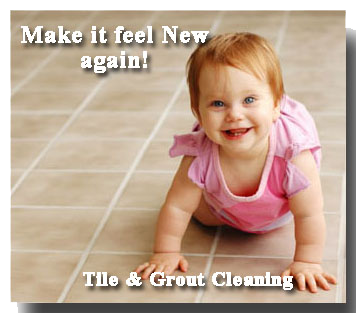 You will save money on spot cleanings, your carpet will look better every day and will last longer.